Yesterday, Fast Company Co. Exist ran "What We Mean When We Talk About 'Empowerment'", the fourth installment of my “7 Reasons for Social Innovation Optimism" series. "One of the defining tropes of today’s social innovation field is the idea of 'empowerment' to frame the outcomes many of us are driving towards for people and communities in need. Nearly every entrepreneurial organization focused on social problem solving, from established to upstart, expresses some version of 'putting people in control of their own lives' as part of their raison d’etre as well as a description of their approach. 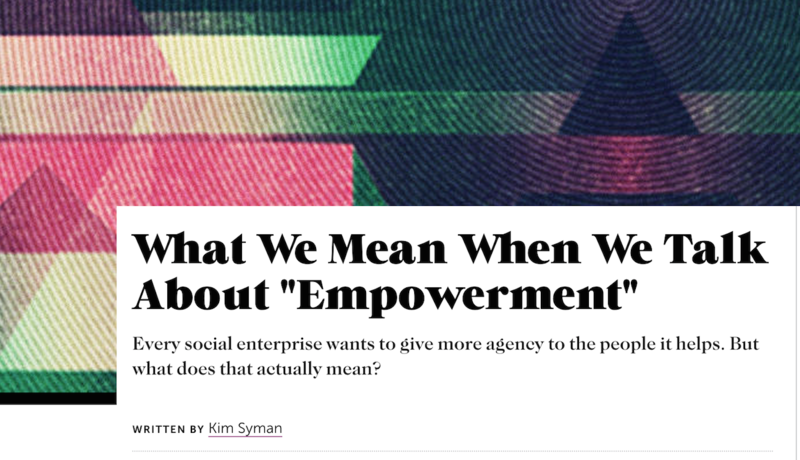 Empowerment is the right goal and offers the hope of a break from some of the "we know what you need" paternalism—not to mention a 'be grateful for whatever we give you' charity mentality—that has too often marked efforts to affect social change." This piece features the amazing work of New Profit's grantee organization LIFT and three organizations from our network: Computers For Youth, Pigeonly and Center For Youth Wellness!